Now that the days are getting longer, it’s tempting to linger over a congenial cocktail or two after work. Even if you can’t make the scene during the week, you’re in luck, because many establishments offer late night deals on weekends. 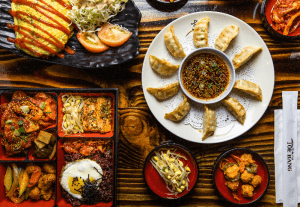 From hidden gems to boisterous biergartens and swanky upscale spots, Koreatown offers some of the best Happy Hours around! Remember to drink responsibly. Choose a designated driver or ride share service. Public transportation in Koreatown is another great option, with major metro stops on the Red and Purple lines. Check out this handy trip planner for what to know before you go! 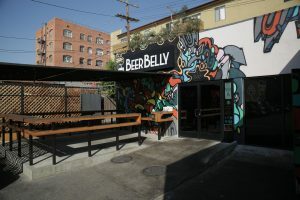 Since opening in 2011, Beer Belly has been the KTown go-to gastropub for craft beer aficionados, garnering them an appearance on Food Network’s Diners, Drive-Ins and Dives. Beer Belly offers 12 rotating taps serving up a fine choice of local brews, and a rotating bottle selection featuring seasonal, domestic and international beers, and the occasional rare bottle from owner Jimmy Han’s personal collection. Nosh on their super-indugent beer snack: Death by Duck fries, tossed in duck fat, smoked salt and sweet onion sugar, with crispy duck skin cracklins and duck confit on top, while getting an eyeful of the colorful wall murals by artist Yoshi Takahashi. This hidden gem offers a friendly ambiance that is intimate, yet fun and hip. The menu includes a tasty choice of sharable Korean tapas, along with a great selection of beer, sake soju and more. Try the Spicy Chicken Gizzards or Kimchi Pizza – guaranteed to go with any drink. Munch to the music, which ranges from American hip hop to K Pop! Named one of the top 5 Happy Hours in Koreatown by the LA Weekly, EMC Seafood & Raw Bar is a popular after work destination for fresh seafood, including plenty of slurpable raw oysters. EMC is a vibrant glass-walled space, presenting floor to ceiling windows, blond wood tables, and an icy raw bar loaded with oysters, live uni, and a seafood tower (for those that like variety). Enjoy your favorite drink from the fully stocked bar served by awesome mixologists. Established in 2010, Biergarten was Koreatown’s first craft beer bar. 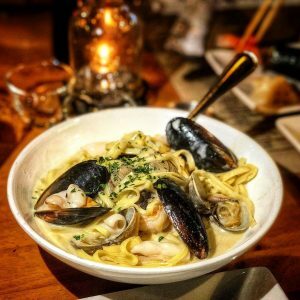 Featured in The Food Network Guy Fieri’s Diners, Drive-Ins and Dives titled Indulgent Dishes, this hip gastropub offers Korean and German fusion food, along with other great bar food items. Biergarten’s extensive draft and tap list offers a vast selection of beers and ales from Germany, Iceland, Belgium, Austria, Denmark, as well as domestic brands. 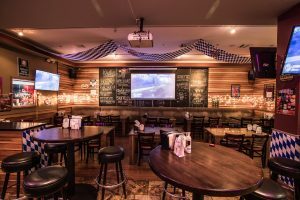 The eclectic beer-friendly menu includes an assortment of burgers, bavarian pretzel, tempura fries, panko fried mushrooms, kimchi pancake, kielbasa corn dog, and German platters such as pork schnitzel and wurst. Looking for a fun time? Maybe some bomb food and drinks, with a serving of good vibes? 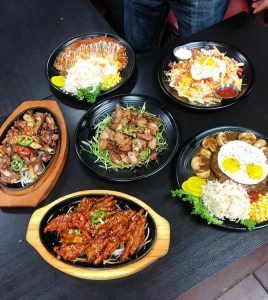 Then check out Toe Bang Cafe, a chill Korean bar in Chapman Plaza offering traditional bites, BBQ, cocktails, and an outdoor patio amid classic decor. 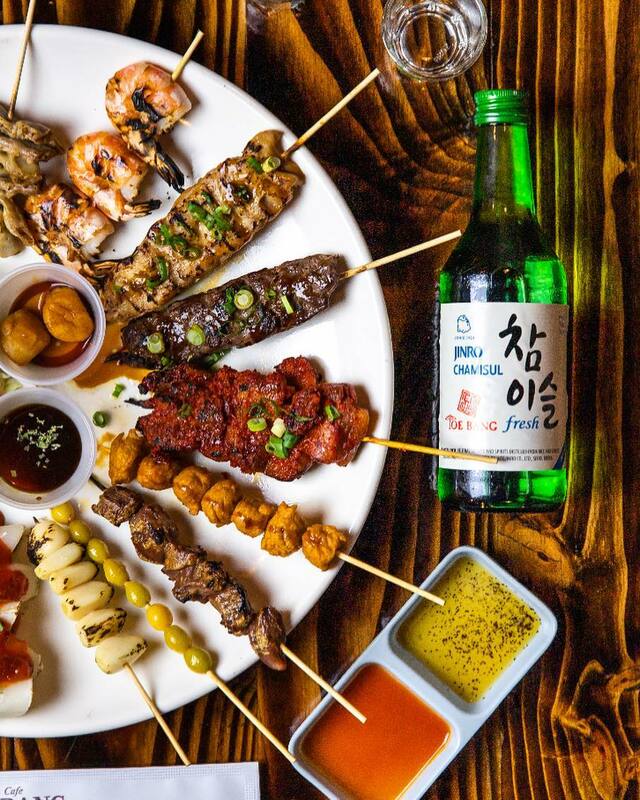 Try the Skewer platter with a delicious grilled assortment – those in the know say it goes well with a shot or two of chamisul, also known as Korean vodka. Other libation-friendly choices include popcorn chicken, chicken wings, and budae jjigae, a sausage stew made with ham, sausage, spam, baked beans, kimchi and gochujang. Located just a few blocks south of the Wiltern in the back corner of the Heyman Center, The Southland is a great pre- or post-concert pit stop. The folks behind The Southland are self-acclaimed craft beer lovers whose dream was to creat a bar to for patrons to hang out in, featuring rotating taps, knowledgeable and friendly staff, a smartly-curated bottle shop, and cool events. The name Southland celebrates the bounty of great beer in southern California, but the selection includes beers from around the world. 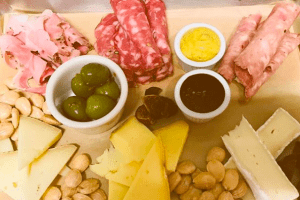 The gastropub offers cheese boards and sausages to pair with your beer, along with small plates featuring spiced popcorn, smoked nuts, and olives, and desserts from Pasta Sisters.